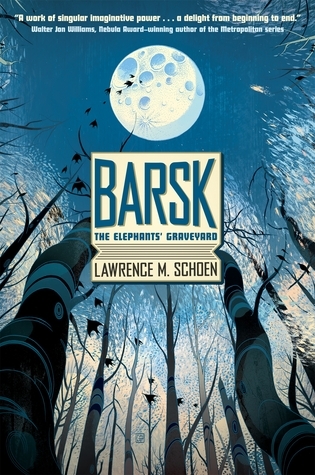 Lawrence M. Schoen’s Barsk: The Elephants’ Graveyard is a wonderfully original masterpiece of a novel, and I am so glad that I got to it in time for Hugo Award nominations. Somehow, I’d thought it was a 2016 book because it came out so late in the year (December 29). Fortunately, it showed up on the Nebula shortlist before I missed out on it entirely. You guys, this book is so good. If you are a Hugo voter, I highly recommend reading this book before you finalize your nominations. 2015 was an amazing year for genre fiction in general, but this novel is definitely at the top of the heap of amazingness. The concept of Barsk is fascinating. Thousands of years in the future, spacefaring anthropomorphic animals of numerous species have colonized the galaxy. A pair of species collectively known as the Fant (descended from Asian and African elephants) inhabit the titular planet, Barsk, where they have been left more or less undisturbed for hundreds of years due to the other (all furred) species’ dislike of them. They might be left alone entirely if the Fant weren’t the only manufacturers of a drug called koph that, in some people, awakens a rare and highly desirable ability to Speak to the dead. Needless to say, after eight centuries of depending solely on the Fant for the drug, not everyone is happy with the current state of affairs. What makes Barsk such a joy to read is that, while it may technically be a flaw, it has a tendency to meander, and there are all kinds of small flourishes that have little to do with the actual plot but that are nice to see as they really work to make the world of Barsk come alive. Sometimes, as well, Schoen includes material that isn’t strictly necessary in order to lighten up some of the story’s darker moments or simply to add some depth to a minor character. In every case, these detours and seemingly extraneous details are naturally integrated with the main story, whether it’s a solitary chapter from Tolta’s point of view or the brief story of the unexpected reunion of two Fant men who were able to have a few days of joy together at the end of their lives. The portrayal of the animal cultures is fascinating. Schoen has clearly done a lot of research, and he does an excellent job of balancing an imagination of what the racial cultures and traits of his anthropomorphized animals might be with a wonderful instinct for character that prevents the animal characters from being too stereotypical. Certainly some of the background groups—especially the Badgers and Pandas—are a little too homogenous-seeming, but even that can be more safely attributed to the fact that the Pandas we see are soldiers and the Badgers are torturers, which accounts for their seemingly monolithic natures. The named characters, however, are, by and large, all unique and compelling individuals. Their species certainly informs who they are, but they aren’t defined by it. The exploration of racism, genocide, and marginalization may seem a little on the nose, and I’m generally not a fan of exploring these themes through fantasy races and cultures, but it works here. The political situation between Barsk and the rest of the colonized worlds is fraught in realistic ways that recall some real-world scenarios but never copy any exactly. This allows Schoen to take a look at some common structures of oppression and exploitation without stepping on the toes of any real people. It’s not the most thorough look at these themes, but it’s well done without being heavy-handed or preachy and the ending of the story is messy and ambiguous enough to keep Barsk from every being called simplistic. If I have any criticism of Barsk, it’s that there’s just not enough of it. I’m thrilled that it’s a standalone title, but I would love to read more stories set in this world. I want to know how Lirlowil turns out or what Pizlo grows up to be like or whether Jorl ever notices the girl in the bookstore or if Tolta ever finds love again. I’d even take a book about what Bish gets up to now that he’s got a fresh start. Barsk is a story that I never wanted to end, and I can’t wait to see what Lawrence M. Schoen writes next. Hi, I’m trying something new with my book reviews where I link to other reviews from book bloggers for a given book. I just posted my review of Barsk and wanted to let you know I linked your review! I disagree about the how well Schoen distinguishes characters from a given species; all-and-all they seem to fit stereotypical and/or scientifically observed behaviors from animals in our world. That said, I also thoroughly enjoyed the book and found it wonderfully imaginative. And I also hope he decides to do a sequel! I actually just discovered your blog while looking up other reviews and love it. And yes yes yes on iZombie!